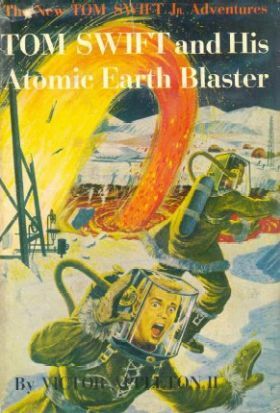 Furious Antarctic storms and ruthless enemies stalk Tom Swift Jr. And his latest atomic invention, the earth blaster, in book number five of this thrilling science-adventure series. When Tom chooses the South Pole as the spot to hunt for molten iron with his earth blaster, his closest friends raise their eyebrows. Even Chow Winkler, the expedition's genial Texan cook, says, "Brand my thermopile, if the young inventor ain't plumb loco!" First Tom has to convince the skeptics about the value of his earth blaster. Preliminary tests prove that it is one of the greatest inventions the world has ever known. When spies of the Kranjovian government learn about the project, it becomes a race to see who will reach the South Pole first. 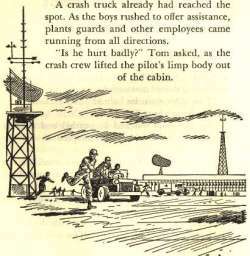 Tom risks his life and al the funds of Swift Enterprises to launch the expedition. With his pal Bud Barclay, Chow, and a group of top-flight technicians, he braves the white fury of the Antarctic ice barriers to set up operations. But the Kranjogians seem to have beaten him to it! In the nerve-racking and chill-packed days that follow, the young inventor is faced with one of the greatest challenges in his career. The outcome hangs in the balance down to the last page of this dynamic story. Read it to see how Tom Swift Jr. startles the world when his atomic earth blaster starts the most phenomenal gusher known to man! The summary below was written by Graeme Woods. Thanks again for volunteering! The most important invention in this book is the Atomic Earth Blaster. The Atomic Earth Blaster is an automated tunneling machine. Tom builds a prototype version that uses mechanical cutters to grind up rocks and dirt before progressing to the final model that uses atomic energy to vaporize rock. The Atomic Earth Blaster is used to drill down to a molten layer of iron deep beneath the earthís crust. How does the Atomic Earth Blaster work? The mechanical Atomic Earth Blaster is nuclear powered, but uses traditional grinding tools to cut into rock. 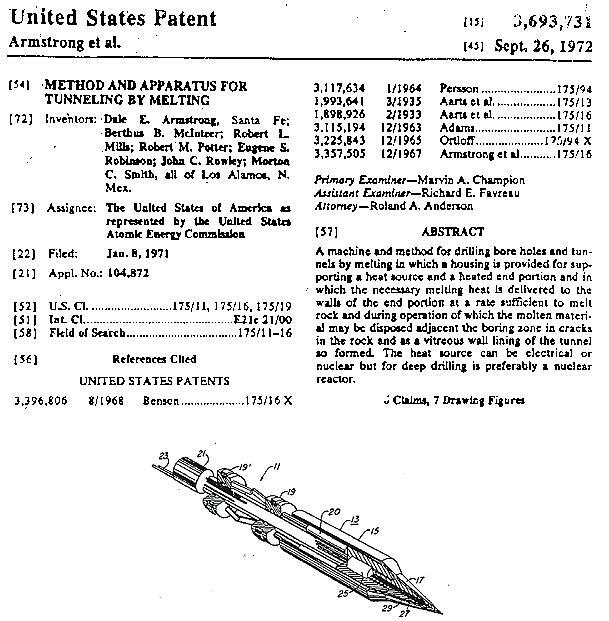 This is similar to existing tunneling tools except that it uses nuclear power. However it appears to be a lot faster, as most tools of this type cut quite slowly. "That sure is a mean-lookiní contraption you got parked outside!" the cook added. "Is that what youíre digginí through to China with?" "Not exactly." Tom grinned. "Thatís only my experimental model. The blaster we take down to the South Pole will be somewhat different." "Well, look at these drawings. Instead of those digging devices you see sticking out the front end of our experimental model, the new one will have four electrodes spaced around the nose and a long guide vane sticking right out of the center." "Whatís the idea oí them things?" Chow asked. "Well, you see, the old model just ground up dirt and rocks mechanically. But on my new blaster, these electrodes sticking out the front will melt any rock on contact. Then the molten liquid will be drawn in through these intake ports, and further smelting will take place inside the machine. The resulting hot gases will jet out through these exhaust ports at the rear." "Instead of using the atomic energy to grind up the dirt and rocks, we could use it to power an electric smelter. This would release gaseous oxygen from the melted rock. And the gas in turn would billow up the shaft, carrying the particles of ore dust with it so we wouldnít need a conveyor." "Hereís a sketch of the launching platform Iíve designed for the South Pole blaster," Tom said, spreading out a blueprint on his fatherís desk. The structure was composed of girders and I beams, and looked somewhat like an upside-down rocket launching platform. Rails were provided to guide the machine on its take-off. Mr. Swift studied the drawing carefully. "I believe this will do the trick, all right, son," he commented. "Of course your machine will only have room for a bare minimum of sheathing around the atomic pile, and that will make things much more difficult. It means the launching will have to be done by remote control to make sure you and the others are exposed as little as possible to dangerous radiation"
Tom nodded thoughtfully. "Iíve already provided for that, Dad." He went on to describe the remote-control system by which he planned to operate the machine. For one thing, he must adapt the cooling system, invented for his giant robot, for use in the earth blaster. This system used a highly paramagnetic fluid which was alternately magnetized and demagnetized. The fluid was circulated through the vacuum tubes inside the robot and controlled by a thermostat to maintain an ideal working temperature of 96.4 Fahrenheit. A similar system would be needed to protect the instruments in the earth blaster from overheating. A hundred miles down, the blaster would have to operate at temperatures of several thousand degrees ñ hot enough to shrivel a human being to ashes! "And speaking of instruments", mused Tom, "sheíll need a gyroscope, too." He smiled at the thought of what might happen if the machine ever veered off course. Would the Atomic Earth Blaster work? Before determining whether the Atomic Earth blaster would work as described, it is interesting to note that several actual prototypes of a similar machine called a nuclear subterrene have been tested and patented by scientists at the Los Alamos National Laboratory, in New Mexico. Three machines were patented, one in 1972 in the name of the United States Atomic Energy Commission and two in the name of the United States Energy Research and Development in 1975. The information in a subsequent study indicates that work had been progressing since the early 1960ís. 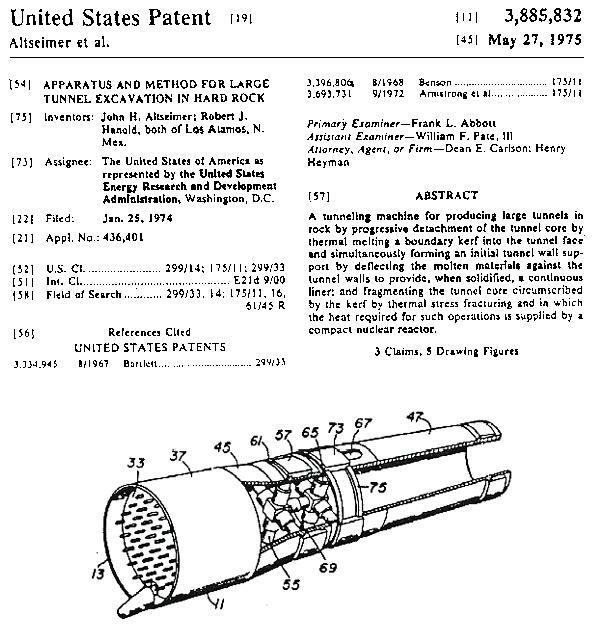 "a machine and method for drilling bore holes and tunnels by melting in which a housing is provided for supporting a heat source and a heated end portion and in which the necessary melting heat is delivered to the walls of the end portion at a rate sufficient to melt rock and during operation of which the molten material may be disposed adjacent the boring zone in cracks in the rock and as a vitreous wall lining of the tunnel so formed. The heat source can be electrical or nuclear, but for deep drilling is preferably a nuclear reactor." The nuclear heated subterrene uses a compact nuclear reactor to transfer heat via liquid lithium to a molybdenum nose that melts the rock. In the process of melting the rock the lithium loses some of its heat. The lithium is then circulated back along the exterior of the tunneling machine to help cool the molten rock to form a vitrified tunnel lining. The cooled lithium then circulates back to the reactor where the whole cycle starts over. The alternative approach uses electrodes to melt the rock. The main difference between the blaster and the subterrene is that the blaster has a second heating cycle that actually vaporizes the rock (converts it from a liquid to gaseous state) rather than just melting it. The vaporized rock is exhausted from the back of the blaster. Since the melting point of rock ranges from 700 degrees Celsius to 1300 degrees Celsius the boiling point of rock would not be too far above this temperature. I therefore believe that it is possible to make a machine out of materials that would support temperatures that would allow rock to be vaporized. Refractory materials such as carbon and hafnium carbide can withstand temperatures in excess of 3500 degrees Celsius. These temperatures would easily vaporize rock. Tomís cooling system could keep the rest of the blaster at a safe working temperature. A carbon-arc could provide the necessary heat. If the rock were heated with air, (perhaps from the oxygen created from smelting as described by Tom) it would effectively "burn" which would allow the temperature to be lowered. Also this would eliminate the problem of the vaporized rock turning back into rock after exiting the blaster and cooling. This is similar to some ablative tunneling systems that use lasers to vaporize the rock. In conclusion, I believe the atomic earth blaster is a possibility because similar machines have been patented and materials are available that would allow it to work as described. 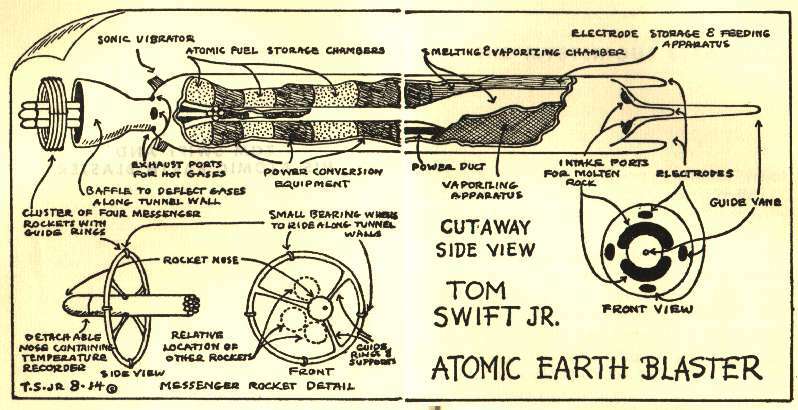 It is interesting that "Tom Swift and His Atomic Earth Blaster" is copyrighted in 1954, before the apparent development of the subterrene and it is also interesting that it contains such a detailed diagram. Perhaps the Los Alamos scientists read the book, or the idea was already being considered. What impact would the Atomic Earth Blaster have on our lives? To answer this question, we need only look at the subterrene, which is a similar machine. The U.S. Federal government conducted two cost studies comparing the subterrene to conventional tunneling technologies. In general, the subterrene could construct tunnels more cheaply than conventional machines because of labour savings and because the molten rock could line the tunnel. This cost advantage was particularly evident with large tunnels or where the rock conditions are very unfavourable. I believe that it is now unlikely that the atomic earth blaster will be commonly used because it is nuclear powered. When the book was written, atomic energy was the way of the future, but since that time the publicís fear of atomic energy and the side effects of exposure to radioactivity has increased and a machine that uses a nuclear reactor is unlikely to gain widespread support. However the blaster would be very useful. A machine that would tunnel cheaply without the need for manual operation would save lives in tunnel construction, which is often very dangerous. Also the lower costs would allow more construction of tunnels for roadways and trains, freeing up space on the surface. An atomic earth blaster could also be used to construct tunnels and underground shelters on the moon or Mars. These could protect astronauts against the harsh conditions and cosmic rays. The blaster could also be used for mining, but not in the way described in the book. The mantle of the earth (the layer below the crust) is now known to not be pure iron, but consists of iron and magnesium silicates, similar to a mineral called olivine. More economical grades of ore are readily available on the surface without the trouble of drilling through the earthís crust.